Spend less for more pages‡: 3000-page black cartridges for under $30, 1500-page color cartridges for under $20. Spend less for more pages with INKvestment cartridges. 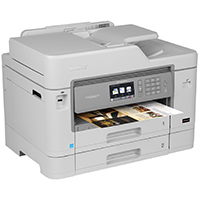 Business-focused features include flexible paper handling capabilities, ability to print up to 11"x17", automatic duplex printing, single-pass duplex copying and scanning, wireless and mobile device connectivity‡, and INKvestment Super High-yield ink cartridges. Two-year limited warranty with free phone support for the life of the product. Think two-sided: Single-pass duplex scan/copy via up to 50-sheet ADF and automatic duplex printing. Print and scan from almost anywhere - smartphone, tablet, laptop, and desktop computer‡. Added convenience of NFC "touch to connect" printing and scanning‡.